Sixteen classic Belgian truffles in mouth-watering flavors including classic butter truffle, extra dark, coffee, cognac, Marc de Champagne, and tiramisu. 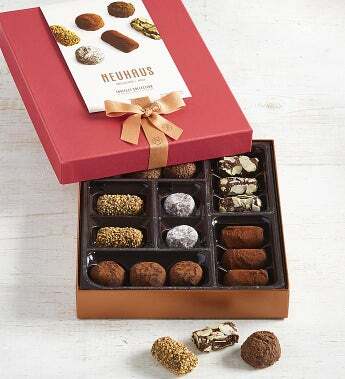 With the first bite, you'll discover why Bloomberg Pursuits declared these Neuhaus confections "The Best Chocolate Truffle in the World"
Contains 16 pieces of Neuhaus Classic Truffles in a Prestige box with a ribbon. Ttl Nt Wt 6.17 oz. Contains 16 pieces of Neuhaus Assorted Truffles in a Prestige box with a ribbon. Sixteen classic Belgian truffles in mouth-watering flavors including classic butter truffle, extra dark, coffee, cognac, Marc de Champagne, and tiramisu. With the first bite, you'll discover why Bloomberg Pursuits declared these Neuhaus confections "The Best Chocolate Truffle in the World".